Ah, curry: the national dish of England! I never go to Indian restaurants in Prague (because they never label vegan options, and sometimes I just don’t trust restaurants to tell me the truth when they know they’ll lose my custom as a result), so I was looking forward to getting some good Indian grub while I was back in the UK. 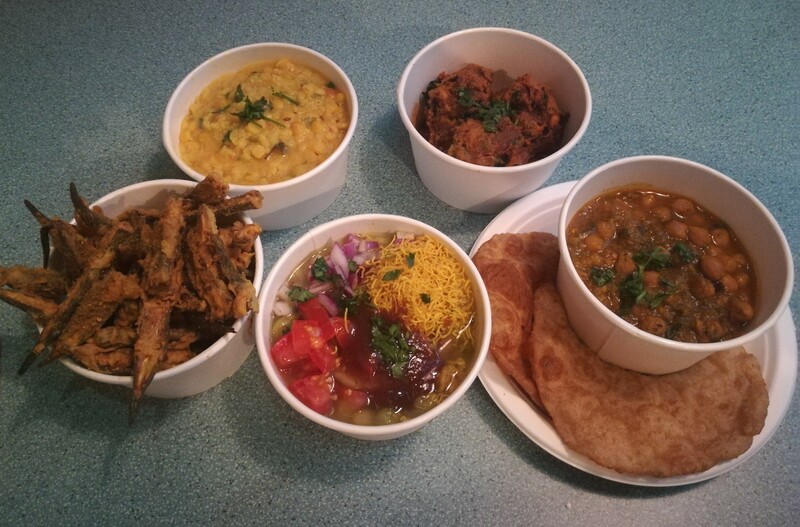 Enter Bundobust, a vegetarian street food place with lots of vegan options, clearly labelled. I’d heard great things about this place, and was surprised to find the restaurant itself quite unappealing: massive, loud, busy, and with signs in broken English (“Wait here to be seated thank you please”, “Welcome please”, “Too much spicy”). Dr HH had been once before and had barely stopped talking since about the okra fries, so we ordered a pot to share with Mama HH. And goodness me, they were the most delicious thing ever! This might actually be the best dish in Manchester. The crispy okra was seasoned to perfection with mango powder and black salt. If you’re in Manchester, go and get some of these. And if you’re not in Manchester, head there now! 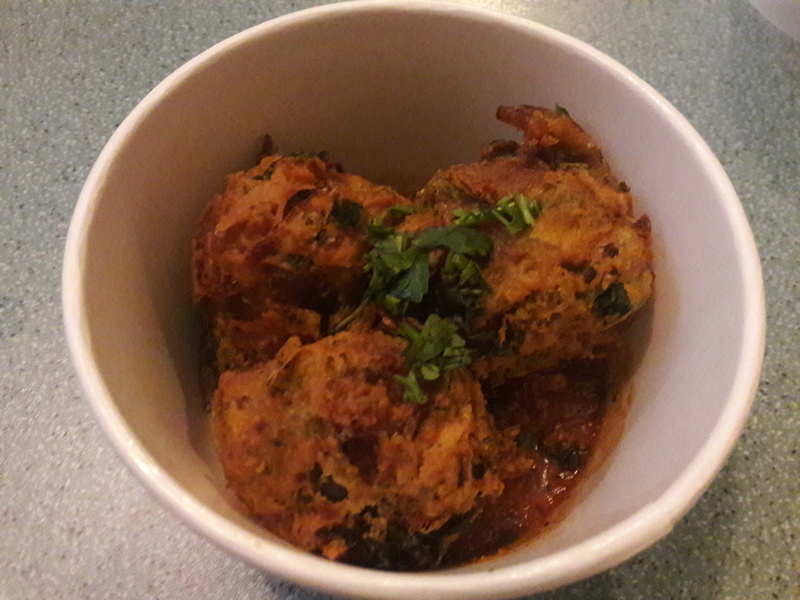 The three of us also shared the onion, kale, and broccoli bhaji, which were quite spicy but tasty. They really just suffered in comparison to the okra fries though. Any time there’s a strange fusion dish on a menu, you can bet that Dr HH will order it. So it was with the raghda pethis, which promised a fusion of northern England and India in the form of mushy peas and potato cake. He was quite disappointed with the final dish. The promised potato cake was in broth, and the “mushy” peas were anything but (that could only be a good thing, in my opinion, considering that mushy peas are an abomination). 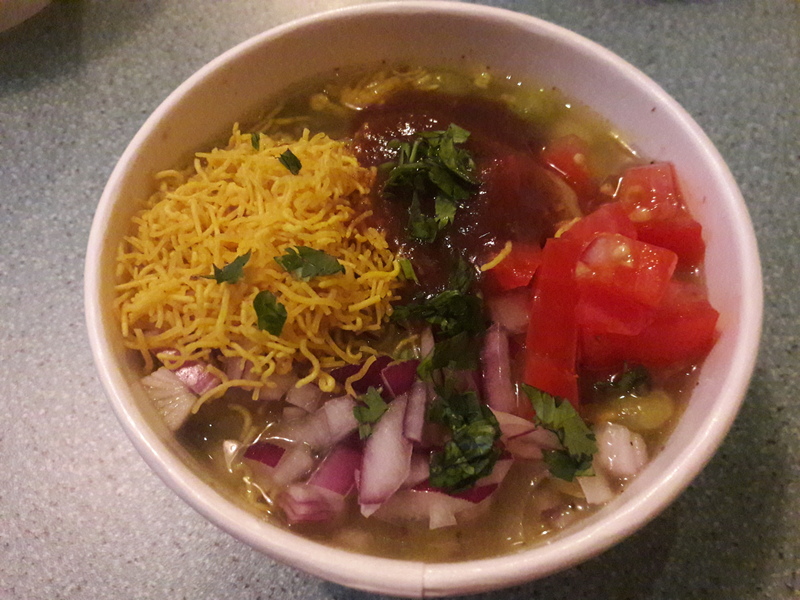 The pot was topped with turmeric noodles, tomato, and tamarind chutney. He found it quite dull, with not much flavour besides the chutney. 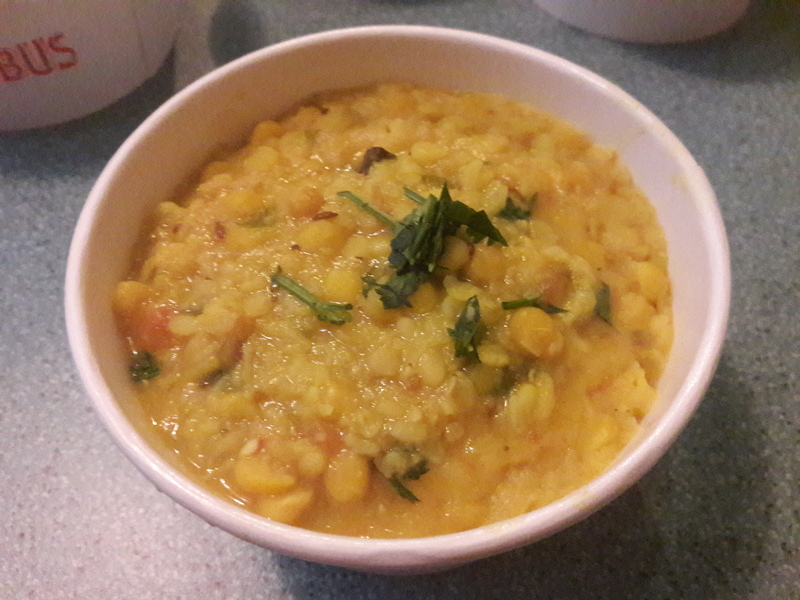 Mama HH played it a bit safer with the tarka dhal, which she found very flavoursome, with an enjoyable texture. 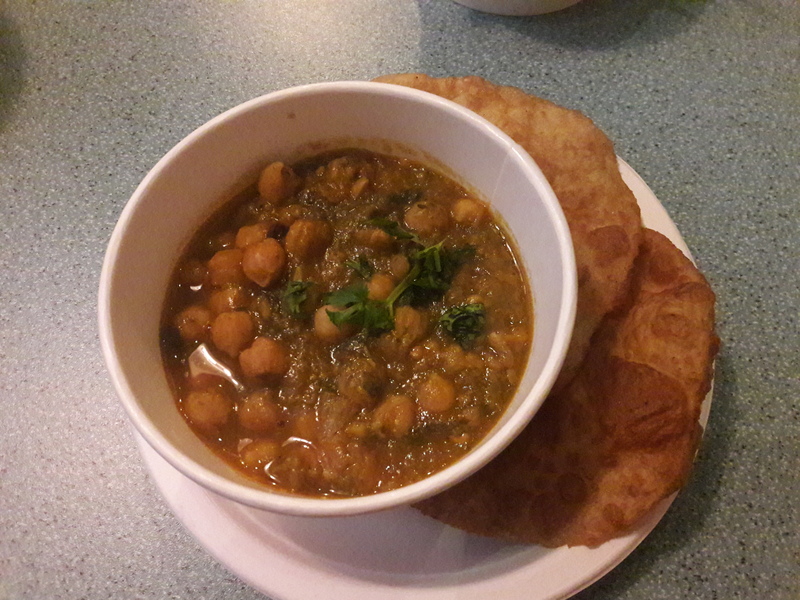 I was probably the winner with my chole saag, if only on the basis that it came with bread. Victory! Actually, the chickpea curry was a touch too spicy for my taste, but it was hearty and warming, and the bread was just wonderful. But really, just go and order several portions of okra fries. Which dish would you order? 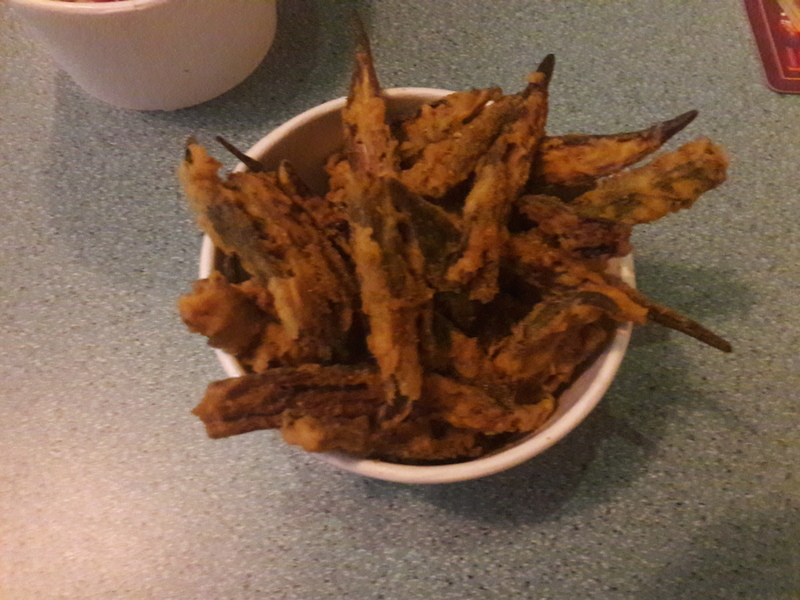 Have you ever had okra fries? 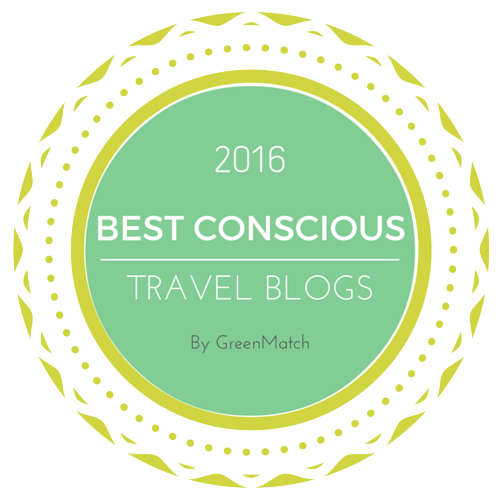 This entry was posted in Travel, Vegan Mofo and tagged Bundobust Manchester vegan, vegan Manchester, veganmofo18. Bookmark the permalink. I’m all about the chickpea dishes! I have had okra fries but I wasn’t overwhelmed by them, obvs weren’t as good as the ones you had! Yes, maybe these ones would change your mind! Good plan! I’m currently on a mission to find okra in Prague. Oh my gosh, okra fries. Crispy roasted okra is one of my favorite foods, so this sounds like an even better version! Love it! They were amazing, see if you can find/make some!